Here is something so unusual we had to share it. 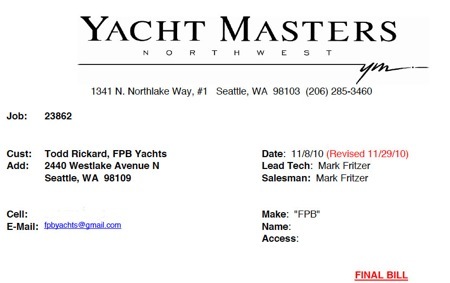 Readers of this website will be familiar with the second FPB 64’s quick exit from New Zealand and subsequent passage to the Pacific Northwest of the USA. With less than 100 hours of sea time she set off on a 6000+ mile shakedown cruise. This is what makes for prematurely bald boat builders. When Sarah Sarah arrived in Seattle of course there was a punch list of warranty items. New boat, 7000 total miles in the first 100 days, you can imagine the yard bill. What would you guess? $50,000? $25,000? How does US$5,660.38 sound? This is an early indicator of what the boat should be like as she matures, very easy on her owner’s budget for maintenance and fuel. This entry was posted on Friday, December 3rd, 2010 at 12:39 am and is filed under FPB 64 Updates. Both comments and pings are currently closed.